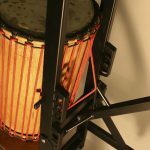 This equipment is designed to simplify the hard stages of tensioning and tuning of a djembe or a doundoun or same types of percussion. Its lever is equipped with a double ergot in the angle studied to exercise simultaneously a little swerve of the circle and a strength downward. The ergot allows to make an auto-blocking knot. The strength is only exercised on the halyard of the top. This system reduces the friction of the skin on the wood and exercises an optimal tension. Selling with a halyard plier auto-blocking specially conceived to not damage the used halyards. Its use, validated by professionals, reduce working time, the effort and allows to improve the finish of hoops on a simple gesture. Its suits the amateurs as well as professionals. The tuning remains easy even in a very difficult condition : with a skin of cow. At the first use of djembe’s tuner, you can realize a work accurate. Robust, achieve the desired tension by pressing only with a hand on the lever, facilitating the pose of the auto-blocking pliers. The mounting becomes fast and comfortable for the back. 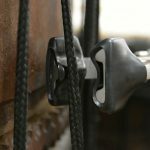 Hands are protected because the lever on its axis allows the pulling of the surplus of rope with ease. 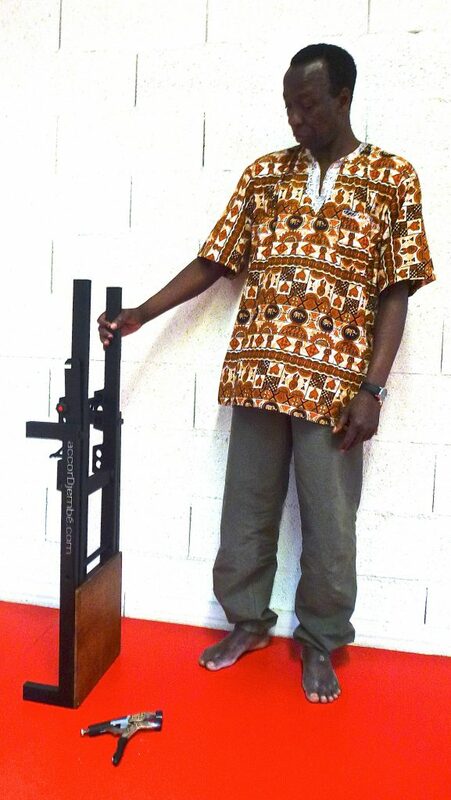 The investment is fast made profitable, knowing that the price of an assembly on a djembe varies between 70n€ and 90 €.